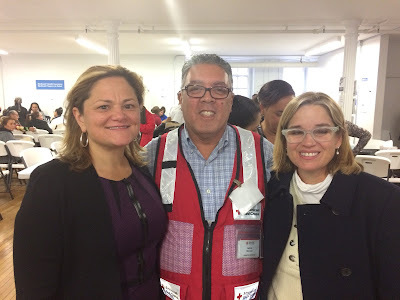 "Thank you @MMViverito & @CarmenYulinCruz for visiting yesterday with our volunteers at the #NYC Service Center who are helping families impacted by #HurricaneMaria from #PuertoRico & #USVI." Over the last 7 days, the Greater New York Red Cross provided emergency assistance to 167 adults and 50 children following 54 local disasters. Here are some highlights from last week and a preview of upcoming activities (see below). On Saturday, our own Matthew Teter serving as Public Affairs Rep. in Southern California gives a tour of a local staging area. Several more of our local volunteers are heading to California to lend their support alongside Matt. Thank you to everyone out there who is helping those in need! Despite the snow delay, training weekend was a success for our volunteers who spent the day learning to be Red Cross Ready! Thank you to all of our Long Island Red Cross Young Patrons for using their holiday spirit to support the mission over the weekend! We are proud to be supported by the Children's Hospital who raised over $500 for Hurricane relief efforts! On Thursday, our Regional CEO Josh Lockwood, spent the day meeting with Senator Tom Cilmi to speak about the Red Cross mission. He spoke on the CSNY panel discussing disaster management for New York. Thank you for sharing our mission! Our holiday “All Hands” meeting for volunteers proved to be a success as volunteers from the New York area gathered to discuss how to help during the holidays with a special twist! For the opening ceremony, volunteers assembled relief kits for our Service Center! Red Crossers were at the scene of a 3 alarm fire in Brooklyn last week! We are still working to #EndHomeFires with local FDNY. To learn more and sign up to help click here! As part of her series, “Island in Crisis,” PIX 11’s Lisa Mateo traveled with an American Red Cross team in Puerto Rico distributing water filters and offering other assistance to residents coping with the aftermath of Maria. Our New York City Service Center has been open since October 2017. One of our volunteers shared his first-hand experience working in the center. Many thanks to the Mayor of San Juan Carmen Yulin Cruz and Speaker Melissa Mark Viverito for stopping by to show their support to volunteers and families in need. Last week, we forgot to give a shout-out to two of our most outstanding, long-time volunteers. Jackie Jones and Fran Bernard were recently honored at the annual Westchester County Senior Hall of Fame for their leadership and advocacy in the community. Congrats to Jackie and Fran for your continued service! Dec 12, 15, 18, 19: Red Cross blood drives will take place from 2 to 7 p.m. at the Greater NY Red Cross building located at 520 West 49th Street, Manhattan. Schedule an appointment to donate today. Dec 13: Sound the Alarm. Save a Life. fire safety event will be in Brentwood on Dec 13 installing free smoke alarms from 10 am to 1 pm. To schedule a free smoke alarm installation and/or to volunteer to help make your community safer, please visit redcross.org/lifiresafety. Dec 17: Sound the Alarm. Save a Life. fire safety event will be in Brooklyn on Dec 2 and 17 from 10 am to 1 pm. To schedule a free smoke alarm installation and/or to volunteer to help make your community safer, please visit redcross.org/nycfiresafety. Dec 29: Please join us at Memories in Williston Park for the Face First show to help those in need this Holiday season!